Mmmmm. Mint jelly with lamb. Made the mint jelly; now all I need is the lamb. Did you know that mint jelly is not really green? It isn’t. It’s golden colored in its natural state. That green stuff you see in the stores is just food coloring. Here’s a straightforward recipe for making your own, using the pectin from fresh tart apples as a jelling base. Because the apples are providing natural pectin, we won’t need to add any commercial pectin to the jelly. The tarter the apples, the more pectin they will usually have. If you are using home picked apples, earliest in the season is best, and the smaller apples will have proportionally more pectin as well. 1 Cook apple and mint in water: Combine apple pieces with water and mint in a large pan. Bring water to a boil then reduce heat and cook 20 minutes, until apples are soft. 2 Add vinegar and simmer: Add vinegar, return to boil. Simmer covered, 5 more minutes. 3 Mash apple pieces: Use a potato masher to mash up the apple pieces to the consistency of thin apple sauce. If the mash is too thick (it should be quite runny), add another 1/2 to 1 cup of water to the pot. 4 Strain apple mash in sieve or with cloth: Spoon the apple pulp into a muslin cloth (or a couple layers of cheesecloth) or a large, fine mesh sieve, suspended over a large bowl. Leave to strain for several hours. Do not squeeze. After a few hours about 4 cups of juice should have strained out of the mash. 5 Measure juice, add sugar, heat until sugar is dissolved: Measure the juice, then pour into a large pot. Add the sugar (7/8 a cup for each cup of juice). Heat on high, stirring to make sure the sugar gets dissolved and doesn't stick to the bottom of the pan or burn. 6 Simmer until set point: Bring to a boil and reduce the heat to medium or medium high, so that you maintain a strong simmer. Cook for 10-15 minutes, using a metal spoon to skim off the surface scum. Continue to boil until a digital thermometer shows that the temperature has reached 8-10°F above the boiling point at your altitude (boiling point is 212°F at sea level, so at sea level the temperature should read 220-222°F). Additional time needed for cooking can be anywhere from 10 minutes to an hour or longer, depending on the amount of water, sugar, and apple pectin in the mix. A thermometer reading isn't always the best way to tell whether or not a jelly is done. Another way to test is put a half teaspoonful of the jelly on a chilled (in the freezer) plate. Allow the jelly to cool a few seconds, then push it with your fingertip. If it wrinkles up, it's ready. I usually start testing the jelly this way when the mixture gets to 218°F. 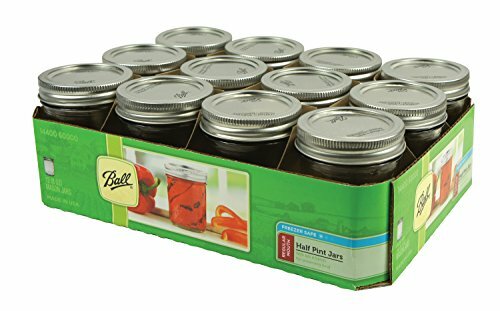 7 Pour into canning jars and seal: Pour into sterilized* canning jars to within 1/4" from the top and seal. Makes approximately 4 8-ounce jars. *There are several ways to sterilize jars for canning. You can run the jars through a short cycle in a dishwasher. You can place the jars in a large pot (12 quart) of water on top of a steaming rack (so they don't touch the bottom of the pan), and bring the water to a boil for 10 minutes. Or you can rinse the jars, dry them, and place them, without lids, in a 200°F oven for 10 minutes. Hello! All photos and content are copyright protected. Please do not use our photos without prior written permission. If you wish to republish this recipe, please rewrite the recipe in your own unique words and link back to Mint Jelly on Simply Recipes. Thank you! Hey Elise! Searching for a home made mint jelly recipe, I happened upon your YouTube vid. Here’s a hint: Instead of the cheesecloth/strainer rig, use a chinois, French for “Chinese”, from whence they originated. This is a fine sieve conical strainer used in Chinese kitchens, and hence in French ones as well. It cuts down the 8-hour draining process, to about 15 minutes using the back of a spoon to swirl around the mush. The pectin solution comes out cloudy, but free of apple bits. My great aunts Pearl and Eva used this tool well into their nineties, and the solution should clarify with sugar, heat, and skimming the foam. For apple sauce just use a chinois with larger holes. Yay!! Hiya Steve! Great idea, thank you!!! its the best mint jelly I have found, especially using the Granny Smith apples for pectin. I am a South African married to a Spaniard and living in Spain, where its impossible to buy mint jelly, which to me, it natural with lamb, which here is a good quality. Thank you so much for your help – incidently mint grows beautifully here, so makes fantastic jelly. I’m so glad you like the mint jelly Jan! It’s one of my favorites. Can you tell me what you do after you have put the jelly in the jars? Just refrigerate? Hello, I saw the comments about the mintiness gone after the 20 minute boil with apples. I plan on trying both ways, but it always seems that the mint only has to steep for 10 minutes, so wonder if the mint gets boiled away. 4 ingredients in addition to water. I’d like to reduce the sugar, but I know some is necessary for gelling and to help preserve it…. I’m thinking of reducing to 1/2 cup sugar per cup of juice (though I’d prefer to reduce even further). Do you think it will work? Hi Jennifer, I’ve only made reduced sugar jellies with Pomona pectin which works with low sugar jellies. I don’t know how reducing the sugar would work with this recipe that uses natural pectin from apples. I do know that if you reduce the sugar substantially that the shell life is greatly reduced, from a year to 3 months. I got a vinegary apple jelly, no mint tasty and through. Very sweet and I cut back on the sugar by about 1/2 cup. Can I reheat to add more mint or just start over? Would the recipe work with 3C water and 1 C vinegar? I would just add more mint. You might also try chopping up some fresh mint, adding it to the jelly, reheating to a boil of course. I haven’t tried making it with less vinegar, but I’m guessing it would still work. Hi Carolyn, you can use your mint jelly right away, though it may may not be as well set as you like. The longer the mint jelly sits, the firmer it gets (to a point). Why NOT squeeze the muslin bag when extracting the juice. I don’t seem to be getting the required amount of juice and the bag has been hanging over the pot all night. What would be the harm in trying to squeeze it out now? ….or…could I run that mash through my single auger juicer? Hi Danielle, when you squeeze the bag you will get a suspended solids coming through that may cloud up your jelly. If that doesn’t matter to you (it’s cosmetic only, the taste is the same), then go ahead and squeeze. Sometimes what I do when there isn’t enough liquid coming out is to stir some boiling water into the mash. Made a batch with a variation of this recipe. Used Apple juice drink instead of water wherever water is called for. Used a large bunch of spearmint, about ten cut off tops, total about the size of a batch of celery. One large ginger root, lightly peeled. Ten or so green serano chile peppers. Ran all that through a food processor until a coarse mush. Added some apple juice and simmered for about ten minutes. 3 lbs of Granny Smith apples, cut up and cooked with more chopped spearmint (another 4 tops or so) and apple drink as directed (bag of apples was 3 lbs. so I went with that instead of the 4 lbs. called for). Strained the apple/mint mush four times through a metal mesh strainer, adding more juice and reheating before each straining. Strained the food processor mush once into the same liquid (then added that mush to the apple/mint mush for use in later making a great Apple/Mint/Ginger/HotPepper cake). Measured the liquid and had 8 cups so I boiled and simmered until reduced down to just under 5 cups. Added the sugar according to directions, 7/8 cup sugar to each cup of liquid. Boiled the sugar liquid to 221f degrees. Could fee/l how thick it was. Ladled into sterile Mason jars. Put on lids and left to cool on counter. Next day all was jellied nicely and went into the fridge! Mixed the remaining mush with about an equal amount of flour/sugar/baking powder mix and baked at 350 for about 50 minutes. Came out GREAT! The ginger and hot pepper makes it a very peppy cake with the apple and mint flavor behind it. May lemon juice be used instead of vinegar? I’d like to be able to dual purpose my mint jelly to make dessert jellied mojhitos. Excellent recipe Elise, the apple jelly formed perfectly but the mint flavour was very weak when I sampled it before putting it in jars. Decided to add another half cup of finely chopped mint leaves immediately before putting into jars. The result was a much improved minty flavour, although you end up with a speckled jelly – no problem as far as I’m concerned. The mint flavour also improves after 24 hours in the fridge. This recipe is an excellent veggie alternative to my traditional jelly made with gelatine. I tried this recipe. I even doubled the mint and I can’t taste the mint. I think I will try this with pork roast also, since the mint is so weak in flaver. Can I just double check this recipe please. I have 8 cups of juice. So how many cups of sugar do I need? Can you use dried mint for this? How much dried mint can I use? Normaly there is fresh mint in my yard in the summer. It’s early spring here. I have an open jar of mint jelly and a portion is crusty white. Is it safe to eat? It seems this always happens when I refrigerate the left overs from a newly open jar. Thank you for this recipe! I followed your recipe exactly, except for draining the juice. I didn’t get much juice out the first time I drained it, so instead I pressed out the solids and then let it drain from the apple sauce that was left. The juice wasn’t very clear, but I decided that it was going to be OK if it wasn’t clear. After I added the sugar and brought it to a boil, the juice became clear! I was amazed! It also gelled better than I could have imagined! I am very amazed that I made something so awesome. Thanks for the good, clear, directions. I’m just finishing the recipe. I’ve got a nice Apple Jelly, no mint. I added the mint in step one as directed. By the end of the 20 minute boil, all the minty-ness was gone. Is the mint supposed to be added with the vinegar? This was great! I was looking for a recipe to use my chocolate mint on – it’s all over the place already this year – and this worked out great! I really like the trick of checking the jelly on a frozen plate. Thanks for the great recipes, Elise! I used this for Easter and thought it was great – thanks! I did have to boil the juice to a much higher temperature than suggested here to get a good jelly consistency, though. I liked that the vinegar added a bit of tanginess to it, but if you’re looking for something more purely sweet like what you’d buy in the supermarket, I might cut down on the vinegar a little — unless it’s necessary to use that much to extract the pectin effectively?